Why use Email to SMS? Any replies to your messages will be delivered straight back into your email inbox. Once this simple SMS solution has been intoduced into your daily work flow, you will notice productivity increases instantly. Less time will be spent chasing customers and colleagues, freeing up your time for more intensive tasks. SMS messages are sent straight to a mobile phone. They are received on-the-go, allowing the recipient to respond quicker than email and with less distraction than a telephone call. 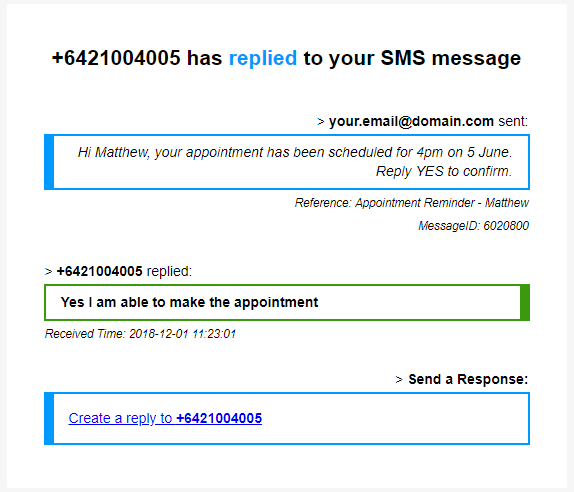 Text messages are typically answered and responded to within a five minute time frame - it's simple for the mobile phone user and it's as easy as an email from your PC. The mobile phone can reply to the text message, which you receive in your email inbox! Once your account has been activated, you can begin using the service immediately. It's as simple as sending an email, no training required. Create a new email. In the TO section insert the mobile number to send to. In the email body, insert the text message. Your email will be delivered as a normal SMS message to the mobile phone. The mobile phone's reply will be delivered to you as an email. Most users prefer Email-to-SMS for sending quick messages to mobile phones. Alternative options include sending broadcast messages using the online dashboard. For developers, we have API Tools to integrate into software packages. You can register an unlimited number of email addresses for Email-to-SMS. By default, you are limited to one message-part (160 characters using the GSM character set). You can increase this via your web dashboard login. See the Sending Longer SMS Messages guide for more information. A delivery report will be available for you to check the status of a message. A result of 'delivered' means the handset has received the message. You can access delivery reports via the web dashboard. Efficient and reliable delivery to Vodafone, Spark and 2Degrees, as well as Australia, the United Kingdom and other worldwide mobile networks. Our SMS Coverage reaches over 75% of the world. We cover 99.7% of Europe, along with 340 networks in 140 countries. Can I resell your SMS service? Send alerts to a wide range of people, fast!